US, 2001, 95 minutes, Colour. Voice talent: Michael J. Fox, James Garner, Leonard Nimoy, David Ogden- Stiers, John Mahoney, Phil Morris, Kree Summer, Jim Varney. 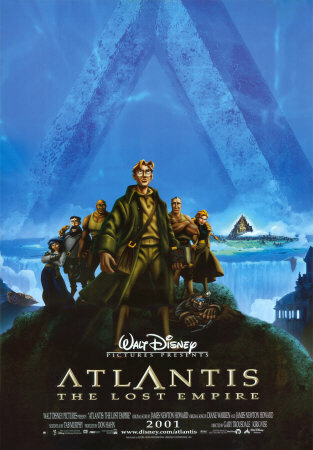 Atlantis was one of Disney’s early films for the 21st century. It is a mixture of entertainment and frustration. It is set in 1914. Michael J. Fox voices Milo Thatch, the grandson of the famous explorer, Thaddeus Thatch. However, he is absent-minded, and works in the boiler room of a museum. He has been studying the documents on Atlantis and wants to find the shepherd’s journal. He also needs funding for his voyage. When he returns to his apartment he finds a woman who takes him to a friend of his grandfather, Preston B. Whitmore (David Ogden Stiers). Armed with the shepherd’s journal, a submarine, a crew, he travels to Atlantis. The difficulty is in the motivation of the crew. Led by Commander Lyle Tiberius Rourke (voiced by James Garner) he finds that he is being menaced and the adventurers want to control Atlantis. Meanwhile in Atlantis, the king (voiced by Leonard Nimoy) is very much concerned about the future of the kingdom as well as his daughter, Princess Kida (voiced by Cree Summer). The visuals are often exciting, the re-creation of Atlantis very attractive in many ways – and there are plenty of adventures, comic touches as well as disasters. The film has not remained in the consciousness of animated film fans – but, it has its moments. 1. The Disney style? Adapted for ancient mythology? Updated to the 20th century? The 1914 expedition? A combination of various eras for an action adventure? 2. The use of the wide screen process? The range of voices and their styles? The musical score and its atmosphere? The final song? 3. The style of the drawings: the human characters, angular, suggesting humour and a touch of caricature? The absence of animals for a Disney film? The locations, the ocean, the style and visuals of Atlantis? The contrast with Washington, DC, in 1914? The technology, the cars, the vehicles, the sea vehicles for the citizens of Atlantis, the expeditionary vehicles? The Star Wars-style spaceships and planes at the beginning? The stone fish and the magic vehicles? 4. Audience knowledge of the myth of Atlantis? Its disappearing into the sea, the reaction of the gods, taking up the queen from Atlantis, leaving the inhabitants to live a long time, the source of energy for their lives, the myth of finding Atlantis? Its various locations - here near Iceland? 5. The introduction to the lost continent, the wars, the loss of energy, the disappearance of the continent into the depths of the sea? The king, Princess Kida? Their survival? 6.Milo and the rehearsal, later, the museum and the boiler, his avoiding the difficulties? 7.Milo’s obsession, the influence of Grandfather Thatch? Whitmore and the test? The discovery of the book, the explanation of the expedition? Helga and her place on the expedition? 8.The introduction to Rourke, the crew? Sweet, Mole, Cookie? Mrs Packard? Audrey? 9.The build-up to the departure, the nature of the journey, the voyage? The difficulties? Milo on board, coping? The explanations? 10.Milo and his character, with each of the characters? 11.The arrival, the crew, life on board the ship, the survival? 12.The portrait of Rourke, James Garner’s voice? The leader, his ambitions, leading the expedition, the gradual revelation of his true self, callous and cruel? 13.Milo and the experience of Atlantis, the joy of the discovery? The encounter with Kida? With the king? The issues of language, communication? 14.The king, his reaction to the intruders, hostility? The confrontations? 15.Rourke, his tough stances, his increased greed, plots with Helga? Members of the crew? Stealing and fleeing? 16.Kida, the attraction towards Milo, the tour? The swim and the explanation? The history of Atlantis, life in Atlantis, the threats? 17.The rescue, the fight? Helga and the attack? Rourke and the monster? 18.The restoration, the monument to the king? 19.Whitmore, his explanation, each member of the team? The achievement? 20.A Disney combination of myth and action?